Cardigan by R-NEAL in fashionable stripe design. With the pleasant mix of materials it ensures a comfortable fit. 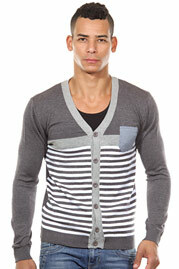 You can combine the trendy cardigan with the eye-catching chest pocket perfectly with t-shirt or long sleeve.